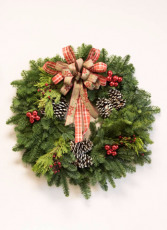 Bring the outside in with this "Cardinal Christmas." 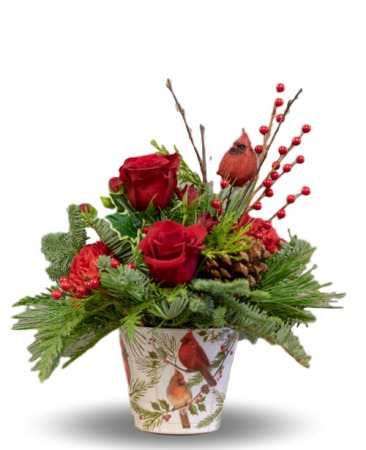 Designed with Christmas Greenery, Roses, Spray Roses, Carnations and a keepsake resin cardinal. Container is 5" tall. Upgraded prices include more flowers and are designed to keep the same look and feel of the arrangement. 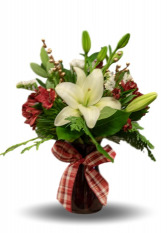 "Tis the Season" is designed in a red vase filled with fragrant evergreens, lilies, alstroemerias and carnations. Vase is 6" tall. Upgraded prices include more flowers and are designed to keep the same look and feel of the arrangement.